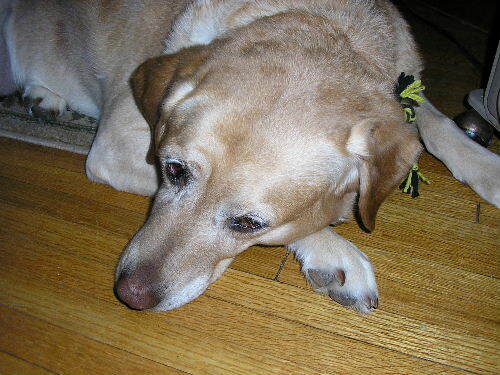 Finnegan Purl Knits: ZYX FRIDAY.... "Y"
Y is for yellow lab. We got Irish in 1996. She will be 10 in July. Against my husband's wishes, my kids and I went to the pet store (yes, I know... you shouldn't do that but it's local and they only buy local puppies) after my son was discharged from the hospital from a particularly bad episode of asthma. (he is NOT allergic to dogs... cats are another story altogether) Anyhow, I had been wanting a dog for a long time and I thought that would cheer all of us up. My husband was not amused. After 10 years, ask me who in the family is more attached to the dog than anyone. Right. My husband. She is without a doubt, the best dog ever. She loves us unconditionally. She goes nuts when the kids come home after being away. I knows she misses them. She sleeps in the hall outside their bedrooms doors every day just waiting for them to get up. This past summer, my son and his girlfriend were fooling around and they pretended they were dead on the couch just to see what she would do (yes, terrible, what can I say?) After she tried to get a stir out of them to no avail, she went out in the kitchen, pushed open the kitchen storm door (which she has NEVER done in 10 years) and ran up on the front porch where my husband was sitting and reading. She started barking at him and he knew something was wrong. He went in the house and asked them what happened in there to cause the dog to act like that. When they told him what they did, we were all so amazed that she turned into "Lassie" the wonder dog. When the kids start raising their voices to one another she positions herself between them just in case. She gets upset during Steeler games when the guys start yelling at the TV because she thinks they are yelling at each other. That's a wonderful story about your dog. Man's best friend is true. Great post! I love animal stories! My cat is the same when voices are raised.She will get right up in my face and yowl very worriedly, even if I am only trying to talk on the phone with my hard-of-hearing dad! What a sweet puppy! And a very amusing story about your husband's unexpected attachment to her. When I got a dog growing up, my father was less than thrilled (the dog was really for me and my younger brother), but in the end they were best friends. She died a couple of years ago, and I know my mom and brother would like to get another dog, but he says no; frankly I think he's still too upset about losing our last friend. Your dog is so beautiful. And what a nice story. Isn't that how it is, those who protest the most, LOL. Looks like your husband and Cheryl's husband have that same trait! Hi Mom. That post had me teary eyed! I miss Irish.